Students in HD 415learn about leadership skills and theories, and apply them real-world efforts, while helping the community along the way. Partnering with different organizations through the Center for Civic Engagementat Washington State University, CTLL Clinical Assistant Professor Anna Whitehallsaid her students help plan and facilitate different community events to help the organization reach its goals. One of those organizations is the Disability Action Center NW, which focuses on helping disabled individuals live independently. Unlike the other organizations, the class has been working with this organization since fall of 2017, chasing a higher goal than first anticipated. 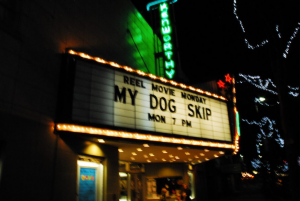 Originally the group’s aim was to raise money for a wheelchair lift for the Kenworthy Theatrein Moscow, Idaho, but after raising the money quickly, they decided there was a larger need. “We realized the wider community wanted it, not only for the stage,” Whitehall said. So, they set their eyes on a $30,000 portable wheelchair lift that could be used for events around the Pullman-Moscow area. With the heavy task at hand, Vicki Leeper, the Disability Action Center NW marketing specialist, started writing grants and created Reel Movie Monday, an event that brings different organizations together to create awareness surrounding various disabilities paired with a movie encompassing the theme each month. Their most recent focus was on service dogs, where dozens of services dogs crowded the theater as groups such as Canine Companions for Independenceand Guiding Paws of the Palouse spoke about their organizations to create awareness and connect with each other. “It’s a great networking opportunity,” Leeper said. The networking not only helped the organization, but the students as well. Toby Madrigal, a junior majoring in human development, said participating in this effort has helped him connect better with the local community and reflect on his role in it. Whitehall said she takes a hands-off approach throughout the semester, letting the students navigate working with the organizations. She said not only are they able to apply these organizational skills to their future careers, but more importantly, to their lives. “It gives them a lens, makes them think, ‘If I had a disability, how would I want to be treated in this situation?’ And makes them able to encompass all ability levels in their careers” she said. Thanks to the efforts of the students and donations from community members, Leeper said they expect to reach their goal by October 2018. The HD 415 group along with the Disability Action Center NW is holding another event, The Making Connections Project, on April 18, 2018 at 2-5:30 p.m. at the 1912 Centerin Moscow that is focused on helping disabled persons learn about resources in the Palouse community.